Combine tomato, butter and onion in a medium saucepan. Add a pinch of salt. Cook over an ultra-low heat setting, uncovered for 45 minutes to one hour, or until droplets of fat separate freely from the tomato. Check seasoning and stir from time to time. Discard the onion. As a final step, you can pass the sauce through a food mill. Note: I used a box of Pomi chopped tomatoes. Obviously fresh is better but it’s difficult to get really good quality tomatoes in the middle of March. When you make this sauce, the only thing you’ll find yourself wishing is that you made double the quantity. It’s amazing. 20 Mar	This entry was published on March 20, 2008 at 2:35 am and is filed under food, general. Bookmark the permalink. Follow any comments here with the RSS feed for this post. Mmmmm. Looks good. Did you make the gnocchi? I may have to boil up some potatoes and make some this weekend. Always a challenge to get them right. There is one Italian grocer in Somerville that sells incredible handmade pasta. Their gnocchi are terrific. They’re easy: potatoes, a little flour, egg (for binding). Occasionally I’ll do something like roasted pepper gnocchi or a pumpkin version. I prefer the basics though. 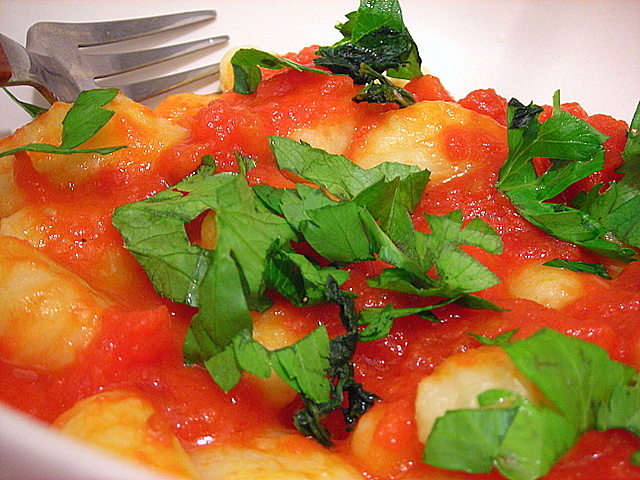 Do you use a particular variety of potato for your gnocchi? I find that they vary greatly in quality, but that’s probably just that I don’t make them frequently. I generally prefer them plain, but I did have some spinach gnocchi in Rome that were unbelievably good. On the other hand, I had some plain ones in Venice that were very regrettable. You want a potato variety that has a relatively low water content and is high in starch. I find russet or Idaho potatoes to be ideal. Yukons tend to fall apart or result in gummy-tasting/textural gnocchi.